Film is a business, a demanding art, and a form of popular entertainment, which makes unreleased films—especially those that were deliberately abandoned by their creators—into objects of perverse fascination. Anything unseen carries an aura of mystery. But with a movie that’s been locked away in a vault or written off for tax purposes, one can’t help but wonder how a group of people can put so much work into something meant for an audience, only to never let it see the light of day. Josef Von Sternberg’s 1924 low-budget debut The Salvation Hunters was the original indie calling card film, by the original Holllywood enfant terrible. It brought the ambitious filmmaker to the attention of the major studios, and though Von Sternberg would go on to direct some of the best films of the late silent era (and made Marlene Dietrich into a global star once sound came around), his first years in Hollywood were a wash. The only early project he managed to get through without quitting or getting fired was A Woman Of The Sea, which marked the only time that Charlie Chaplin produced a film for another director. Also known as The Sea Gulls, this drama about an impoverished fishing community was meant as a vehicle for Chaplin’s longtime leading lady, Edna Purviance. The perfectionist Chaplin was ultimately disappointed in the completed 75-minute film, and opted not to release it, making it one of the most famous unseen films of its era. The Adventures Of Pinocchio could have been the world’s first cel animated feature, but like so many ambitious film projects undertaken in Fascist Italy (see: the next entry on this list), it collapsed under it own weight. Commissioned by Alfredo Rocco, one of the main economic strategists of the Fascist state, this adaptation of Carlo Collodi’s classic children’s book completed 150,000 frames of animation before running out of money. Had it been completed on schedule, the black-and-white feature would have been released before Snow White And The Seven Dwarfs. Attempts were made to color and re-film the footage in 1940, the same year that Disney put out its own version of Pinocchio. Benito Mussolini’s movie-mad son, Vittorio, was his father’s point man in the Fascist film industry. This put him at the front of its most ill-fated ventures, from a widely ridiculed partnership with Laurel and Hardy and Our Gang producer Hal Roach (which resulted in one of the era’s more indelibly bizarre propaganda newsreels) to the production of the costly flop Scipio Africanus. The younger Mussolini’s producing career ended with Knights Of The Desert, an adaptation of an adventure novel by the hugely prolific and popular pulp writer Emilio Salgari, which the dictator’s son co-scripted with a then-unknown Federico Fellini. The lengthy shoot in occupied Libya was a disaster from the get-go: filming was regularly interrupted by Allied bombing; actor-director Osvaldo Valenti and co-star Luisa Ferida (both later executed by Italian partisans) were addicted to cocaine; and broken supply lines sometimes left the crew without film stock. Is there a better testament to the creative genius of Orson Welles than the fact that he rightly earned a place in the pantheon of great filmmakers despite leaving behind a body of work that is partly compromised or incomplete? The recently restored Chimes At Midnight was the last big narrative project Welles finished (followed by TV productions and documentaries, including the inexhaustible F For Fake), but hardly the last one he started. The two late-period productions that came the closest to completion were The Deep and The Other Side Of The Wind. The former was a thriller, adapted from the same novel as the 1989 movie Dead Calm. The latter is arguably the most mythologized unfinished project of the last phase of Welles’ career, a satire about Hollywood that starred real-life directors John Huston and Peter Bogdanovich as, respectively, an aging macho filmmaker and his young protégé. 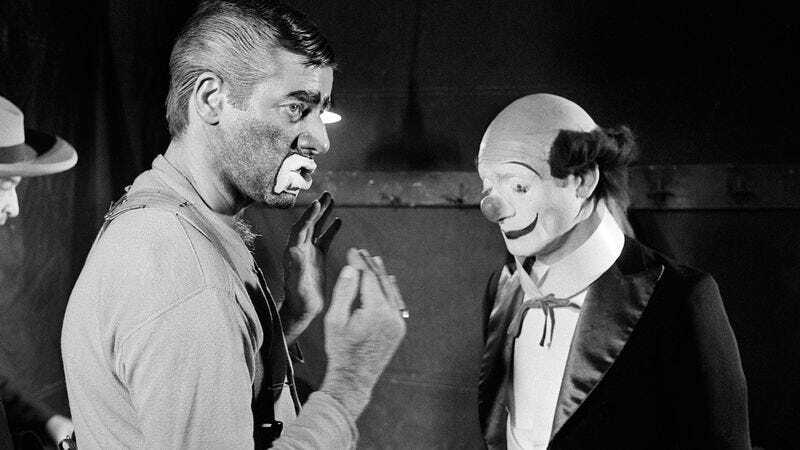 Rumors about Jerry Lewis’ spectacularly ill-conceived Holocaust drama—about a German circus clown forced to lead Jewish children to the gas chamber as punishment for publicly mocking Hitler—have been circulating through Hollywood since the film was (barely) completed in 1972. Dismissed by co-writer Joan O’Brien as a “disaster,” the film was reportedly screened privately for a small group of comedians in 1979. The only one who’s talked about it publicly is Harry Shearer, who described the film as being like “if you flew down to Tijuana and suddenly saw a painting on black velvet of Auschwitz” to Spy Magazine in 1992. More recently, a German making-of documentary containing footage from the film surfaced online, further ensuring that Lewis will be asked about it at every Q&A he does for the rest of his life. Tim Burton idolized Vincent Price since childhood. The godfather of American cinematic macabre was even the subject of Burton first animated short in 1982, simply titled Vincent. While the oddball director worked with Price on 1990’s Edward Scissorhands, he asked the legendary actor if he’d be willing to let Burton make a documentary about his life. Price agreed, and over the course of three days in April, Burton shot footage of Price at the Vincent Price Gallery in East Los Angeles College. Shot in black and white and given the working title Conversations With Vincent, production on the film stalled after Burton was immersed in the making of Batman Returns, and then was delayed further still following Price’s death in 1993. However, in December ’94 it was announced he was finishing up work on the film, and had renamed it A Visit With Vincent, saying it ran about one hour. But soon thereafter, the project withered on the vine, and was never released. Hailing from an era when the merest whisper of “saving the environment” could have Hollywood’s top-tier stars beating a globally conscious path to your door, Roger Holzberg’s animated TV movie is mostly notable for the excess of talent it managed to lure in. James Earl Jones, Michael J. Fox, Demi Moore, Ted Danson, Madeline Kahn, and John Candy all contributed voices or live-action acting to the special, originally conceived to run Earth Day 1997, complete with promos from globe-saving stars like Kevin Bacon, Olivia Newton-John, and Meryl Streep. But though Kahn and Candy recorded their characters’ dialogue before their deaths in 1999 and 1994, the film’s animation was never completed, leaving us with nothing but concept art images of characters like Candy’s villainous “Smokestack Sam” or the car-cowboy hybrid XLR8. And while it pains us to know we’ll never get to hear the movie’s soundtrack—featuring music from Kirk Cameron and Ice-T, according to IMDB—it’s the loss of Candy and Kahn’s vocal stylings that seems like the biggest waste. Conspiracy-obsessed SoCal surfer Chris Carter is best known for creating The X-Files, Millennium, and assorted series that promised to be like The X-Files and Millennium, but were nowhere as good. And then there’s Fencewalker, the reportedly autobiographical, late-1970s-set coming-of-age film that Carter filmed around his hometown of Bellflower, California in the summer of 2008, around the same time that The X-Files: I Want To Believe hit theaters. Described in vague terms as a departure from its writer-director’s best-known work and as “a personal project,” Fencewalker was made with a cast composed mostly of young actors (the biggest name involved was Xzibit, then fresh off Pimp My Ride) and has never seen the light of day. Dau, the defining runaway film production of our time (if not all time), makes Heaven’s Gate look like an exercise in minimalist restraint. With just one somewhat well-received, semi-surreal solo directing effort under his belt, the Russian director Ilya Khrzhanovsky somehow pulled together the resources to create what’s been popularly described as a real-life Synecdoche, New York: a movie about an isolated Stalinist research community, shot under conditions that suggested a bizarre totalitarian state. Ostensibly a biographical drama about the Nobel Prize-winning physicist Lev Landau, Dau filmed for three years in a neighborhood-sized set where much of the cast lived full-time in 1950s conditions. Microphones were hidden everywhere and everything from canned food and cigarettes to the plumbing were produced to period specifications. The dense resume of the prolific, multi-tasking, not-really-retired Steven Soderbergh ranges from superbly entertaining blockbuster heist movies to experimental exercises, so it should be no surprise that it includes at least one unreleased project. The Last Time I Saw Michael Gregg was filmed in 10 days while Soderbergh was in Australia to direct a play at the Sydney Theatre Company, and is said to focus on a group of actors working on a production of Anton Chekhov’s Three Sisters. Its cast included The Babadook’s Essie Davis, and Cate Blanchett, who was then the Sydney Theatre Company’s artistic director. Consider this another testament to the folly of misguided rich men believing they can do anything. Empires Of The Deep was the brainchild of real estate billionaire Jon Jiang (a.k.a. Jiang Hongyu), a film meant to be China’s answer to Avatar and proof the country could compete with the U.S. in the global blockbuster market. Instead, the project ballooned into an unwieldy mess, plagued by endless rewriters, reshoots, a revolving door of directors, and the general impression that the man at the heart of it all didn’t really know what he was doing. (A New York Times piece assessing the production at the time includes such telling details as government officials demanding more Chinese elements, resulting in the producers being forced to “add a race of dragon people” to the story.) A film about mysterious creatures fighting for control of the massive underwater realm of the Earth’s oceans became a cautionary tale about squabbles for control of a film ruining the entire project.